Eliminating bad behavior at the table will eliminate a lot of poor eating. Marlena’s children weren’t good eaters; instead, they were screamers. Marlena tried to control their eating. It didn’t work very well. At all. Instead, they controlled her and got their own way by screaming and refusing to eat. Four-year-old Walker was surviving mainly on bean-and-cheese tacos. If he didn’t like what was for dinner (which was most of the time), he’d go to bed hungry and wake up in the night screaming for food. So his mom had started feeding him right before bed, a “second dinner,” of whatever food he wanted, to get him to stay asleep so they all could sleep. When two-year-old Jennifer didn’t get her way, she screamed. Her parents would scramble to make her happy to end the screaming. Marlena’s action plan was to micromanage, bribe, beg, threaten, punish, distract, and join the screaming herself, to get them to eat what she wanted them to eat, bite by bite. One night she let Walker play video games while she spooned chicken and rice into his mouth. If Jennifer wanted more tomatoes, her mother would tell her she had to eat a bite of fish first, then rice. Desperate for change, Marlena invited me to play Super Dinner Nanny at her house. The first surprise that night was that the kids’ screaming went unremarked upon, unchallenged. No one expressed the least objection to it. Marlena’s husband sometimes wore earplugs to the dinner table, she had told me earlier. Marlena’s first mistake, as with so many parents, was in trying to make her kids eat. 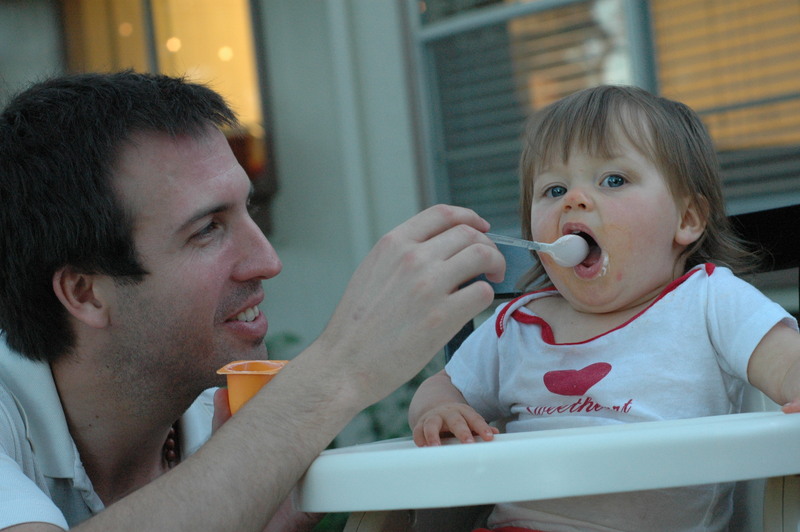 Eating is a personal bodily function, regulated and prompted from within, from birth. That mistake was compounded, as it generally is, by a misguided lack of control over children’s antisocial behavior, particularly at the table. Kids use food refusal to get to misbehave and lord over their parents. Parents let them misbehave out of desperation to get them to eat. Unlike with eating, kids are born unequipped to do otherwise than behave rudely and annoyingly. Good behavior is unnatural and requires far more intervention than eating. Children are completely dependent on parents to train them to behave. When you try to control a child’s eating, what is truly only up to him to control, things will go wrong. When you don’t try to control this behavior, things also go wrong. We can try to force children to eat, and they might appear to go along with it at times, but their rebellion will come out somehow, sometimes in ways that are harmful to themselves. I can’t say I blame them for rebelling. How would you like it if someone made you eat something you didn’t want? Kids are going to eat, you only have to know how to channel their hunger. It’s one of the few things, which include sleeping and defecating, you don’t have to make them do. There’s a whole load of other things connected to those things you have to make them do, but not those things. So I told Marlena to do the opposite of what she was doing. Quit controlling, or trying to control, what her kids put in their mouths. Their own eating needs to be entirely up to them. Provide only foods you are happy about them eating. Let them serve themselves, decide how much they want, and what they want. No pressure of any kind to eat anything, ever. Start controlling their behavior. That is your job. Do not allow screaming, ever. Screaming for what they want is a bad habit and we do them no favors in allowing it. No one will accept it from them and neither should their parents. Restrict negative eating, rather than pushing positive eating. Keep them from eating junk or whatever it is you don’t want them to eat. Keep them from eating dinner in front of the TV. Don’t make something different for them if they don’t like what’s served. Don’t let them eat at the table, or maybe eat at all, unless they follow your requirements and use age-appropriate manners, including no whining and complaining. This is the hard part. Kids who are used to getting their way may scream, get angry and even violent, at this point. But once they know you mean business, and feel the pain of hunger, they shape up. Marlena realized that if she wasn’t going to allow her children to scream at her, she would have to curtail her own screaming at them. Not a bad idea in itself. Marlena’s path to change at the dinner table has not been a direct one, with a lot of coaching, along with false starts and reverses. When she was on the path, it worked. She reported that her children loved filling their own plates and being left alone about what and how much they ate. The first time she tried it, Walker tested his limits with abominable behavior. He was sent to bed and cried himself to sleep. She felt terrible about it. I need a little more help. The first bullet includes: "No pressure of any kind to eat anything, ever." The third point includes: "Don’t make something different for them if they don’t like what’s served." That sounds like a lot of pressure. What do you do when they won't eat what you have prepared? I know they wan't starve, but my kids have and will skip meals because they don't like it. Thanks! Anna, I agree with "serving themselves" but I know that my 6-year-old would eat only meat and bread if we did that! What do you think?? He eats the veggies if we put them on his plate though. So far so good, the progress has plateaued a bit, but I am assuming that is to be expected. I am making the 2 things at dinner cold & unattractive, often right out of the tupperware, but I often used to serve it that way anyway - what with making individual dinners for everyone! My older (more picky) daughter definitely still goes for the 2 things that are her favorites and my younger one does to to a lesser degree, but when I serve something the older one "used to" like in the past, but hadn't been eating in the last few months, she seems to be eating those right up too. She has eaten some new foods, she now will eat a few more fruits than she used to. The combination foods are much harder for her, don't think she has tried one of those yet, even our younger daughter is more hesitant around those ones. But, we are already finding our younger (less picky) daughter following our lead now and, sometimes right away and sometimes after a few tries, she already has enjoyed several new foods. As for my older daughter, she has never been a "food lover". I clearly remember when we first started foods with her, it took a long time for her to show much interest at all. I heard of kids who would reach for what their parents were eating, as a sign of interest, but my daughter NEVER did that. She seems always very standoffish when it came to food. Yes, after lots of months of that, we did pressure - "eat a few more bites of this, of that, etc", so that didn't help things either. She can also be full after not all that much food too, so that is part of it. She has a perfect growth chart though, tall, lean and strong, so I don't worry too much about that. Back in Dec, I even had a long talk with my pediatrician about it and she felt good about my daughters overall health. I do think my daughter has a degree of an innate skepticism about food and has ALWAYS been leery of trying new foods. My daughter didn't even try birthday cake until she was at least 2.5. So, you can see it works in our favor too - to this day she has no interest in juice - only milk and water! One time, about 1.5 yrs ago, I cooked scrambled eggs for myself for breakfast for THREE weeks (on purpose), without one time pressuring her to eat or try them. At the end of 3 weeks, she finally asked to try them. She said she liked them but didn't eat them again until last week! All that said, I am still highly motivated to keep doing what we are doing to expand her interest in food. I view this as a phobia for her in some ways, and I love this approach because I don't want to push, but I DO want to help her. Yesterday, I reserved a few books at the library - cooking with kids books, that have pictures. I have cooked with her in the past and she still hasn't tried the food (even picked some of that food from our garden! ), but she was still afraid to try it. Sometimes she gets excited to try something (mentally) but the second it becomes reality (actually putting it in her mouth) she clams up and gets visibly nervous and says "maybe another time". I am hoping that if we go through the cook books together, reading it and SHE finds/picks a few recipes SHE wants to try then maybe she will be more interested in trying the final result (rather than me picking the recipe, as we have done in the past). Even if we make something together, I still won't make her try it if she doesn't want to. I am realizing that this has to come from her, it is her "phobia", her deal. I can't fix it, but I can set up the right environment to help her get past it. It has been over 2.5 years since she has been on solid foods, and it isn't going to be just a few weeks to undo all that is going on in that pretty little head of hers regarding food. I am just taking it day by day and serving 1 meal at as many meals as I can! I am convinced that we are taking the right approach, thanks to YOU, and with time it will get progressively better! I still think we are on the upswing, but it is just slow going! Betsy, so glad to hear that your husband is liking the results. It sounds like you are making real progress. It may be slow, but it seems pretty steady. I hope that full results may come all at once at a tipping point when your daughter finds it no longer worth her while to be fussy and that being unfussy is more fun. Stand strong! It could take some time for your girls to get used to the freedom and adapt their attitudes. Once they feel safe from any pressure, I'm sure they'll be interested in trying new foods. I encourage you to continue to look for ways to make being fussy unattractive and being unfussy attractive, exciting and fun. You can casually run out of things like PBJ makings if you want to break the habit. Make new foods beautiful and fragrant. Make their old favorites stale, dried up, cold, scant, squashed, poorly presented, whatever. I think having only a little bit left of their favorites and some really enticing new options when they're starving might be interesting to see. Don't reinforce fussiness with your attention or trying to make them happy. Keep on staying in charge with no random snacking and the rules on behavior (no whining and fussing) and not putting up with what you want to change in them. Keep me posted! Hi Betsy, I've been trying to figure out what questions I haven't answered yet! I don't think I've talked about the specific requests: "Mommy can I have my cereal without milk? Mommy, can I have cheddar cheese with my lunch? What about silly things like, will you cut my cheese in sticks? I often chalk these things up to 'picking your battles,' and usually comply, as long I am asked nicely and I try to give opportunities for my toddlers to feel in control on the little things I don’t feel strongly about." I like what you did about the peel on the nectarines with her. When it's work for her, instead of you, she no longer minds what was a problem. It's like my son, who was a mostly-vegetarian for several years living at home, and I catered to him, but when he went off to college, it became more his problem and he gave it up! I think she probably gets a charge out of being difficult and getting you to try to make her happy. It seems to me she wants to be in control by controlling YOU, not herself. You want that to NOT work for her; rather what she should find more worth her while is being agreeable and taking care of herself without drawing a lot of attention to herself or being difficult and demanding. If she wants to eat cereal without milk, I'd certainly let her do that. I would never make anyone put anything in their mouth that they didn't want. It's no trouble for you, either. Let her do what she wants but don't do for her what she wants you to do, I think would be a guideline here. I think I would try to be low key about all those little requests. You could answer things like, "I'm saving the cheddar cheese for something else," or "No, I don't feel like cutting up the cheese sticks. I'm tired and hungry and let's just eat." Or if you feel like doing it, go ahead. But she should know you are not her slave and if you don't want to, she can be OK with being told no. Kids do want to be in control, and being allowed to not eat or to fill their own plates are good ways to give that to them. Controlling what goes in her own mouth is the main thing kids need control over at the table. Very little else, really. Also giving her jobs in the meal preparation is great. Maybe you could give her a way to cut up her own cheese. If it's making you take extra trouble or you just don't want to, those are good things to get her used to accepting. Or if you think she's just trying to get you to do what she wants you to do, just say no. I would avoid reinforcing those behaviors. If you don't want her to be that way with other people (who won't have your patience with her), better react against it early and gently. It is a little surprising to me that she has all these little preferences and requests. I think she's trying to get you going to please her, get you fluttering around. I think continued nonchalance is probably a good strategy. If she is arguing and pulling you back into food struggles, I would try to make that a big No-No. You can tell her no to anything you want to, and if she fusses and argues or whines, give a punishment: she can't eat at the table with you, or has to go to her room, maybe. Let her know if you do not want to be asked about food at all. If you don't like what she's doing, don't accept it from her. It sounds tiresome to me. Maybe just let her know that you work hard to feed her well, and while she doesn't have to eat any of it at all ever again, you do not want to take her requests, at all. You can tell her it makes it hard for you, or you only want to hear gratitude and appreciation or a polite no thanks, nothing else. It's up to you what's on the table, and up to her what she eats of that. Keep it simple. If you think about the kind of person you want her to be with others, that might help guide you. If she starts in, maybe say, "Is that a request?" or "do I hear whining?" How are things going? I'm thrilled to hear about how your girls are responding to your changes. I hope it's going well. Betsy, Now here we have plenty to chew on! First of all, I'm thrilled that you are finding things here you can use and are working. I am going to just respond a little at a time: more later! Mainly I want to just say, keep it up! It will work! You are really making tons of good moves. I'm excited to support you in it. Having specific snack and meal times is SO important. That's the best way to arrange for kids to be hungry for what you want them to eat. If that was ALL you changed I'm sure it would help quite a bit. As you have seen, their appetites are better. Their appetite is the key thing to leverage. Shamelessly take advantage of their hunger to move them in the right direction. Food is always more appealing if you're hungry! Your expectations for mealtimes seem perfect and I am sure will be very valuable. Stick to it. Your children may challenge you, but things will continue to improve if you tough it out, while continuing to back off where you need to. I love how you got your daughter involved in the kitchen. The results of your dinner the other day must be very encouraging. Quality time, less stress, only one meal to make, a child involved in meal preparation! I encourage you to do more of the same! Get her cooking and she's bound to want to eat it! I will get back to answering more of these questions soon, but I will just give one caution: avoid praising or acting excited or affirming your girls for eating better. That's a big mistake a lot of people make. It could set you back. No need to affirm them for doing something they are doing for enjoyment. You don't want them to feel manipulated or pushed or controlled. You want them to take their own satisfaction in their eating. You could say things like, "I'm glad you enjoyed that" or "I guess you are hungry and you liked that." Let them do it for themselves, not for you. Or share your own feelings a little: "I feel good when I make something people like to eat." Or "I had fun getting dinner ready with you." I'm dying to answer more questions, but I have to go get our own dinner moving! Betsy, Thanks for joining in! I'm happy to get your question! If you want your children to begin eating normally (enjoying a variety of healthy foods, unafraid of food, unfussy) I would NOT make a separate meal for them or continue to cater to their fussiness. That is NOT necessary or conducive to normal relationships with eating. Eating the same few foods, even if they are pretty acceptable, is not OK. It's not healthy or normal, physically or psychologically. I would definitely NOT EVER offer any rewards for trying food. Working harder is not better here. Those solutions are counter-productive. Looking at your situation, I think the three main principles to focus on are: 1. Not pushing, encouraging, begging, forcing, rewarding or otherwise trying to get your daughters to eat. Anything. Ever. At all. My bet is that if your child is afraid to eat things, it's because she's been pushed before. If kids are never pushed to eat, they will eat on their own. They are naturally open to food, if that openness isn't tampered with. The more they are pressured to eat, the more they become resistant. How would you feel if someone were trying to make you eat? 2. Instead of pressuring them to eat, leverage the appetite. All the external motivators to eat (including you) have to be taken out of action and their own appetite put back in charge. You have an enormous asset here: kids have to eat. They want to eat. If you set up the situation properly so that they are hungry at the right time, they will end up eating what you give them. IF you don't ever push them to actually eat. Structure everything else: the time, the food, the place, the behavior, the atmosphere. Then get out of their way. 3. Instead of pushing any food, pull away the food. Restrict their access to food. No snacking between meals, which spoils their appetite. No bailing them out after meals when they didn't eat when it was time. Even pretending you don't want them to eat something can work very well. Tell them there's not really enough for them. You will find that when your approach changes, their attitude will change. Maybe not overnight, but eventually. Hunger is a quick teacher. OK, there's one more key principle: nonchalance. You must quit being emotional about food with them. You have to pretend not to care what or how much they eat. That caring has to cease. It needs to be their problem, not yours. Pretend to be up to nothing, but know what you are doing. Don't announce a Big Change. Just start sharing the food with the kids, talk about other things, and keep out of their eating. Slow change is probably a good idea here. You could go fast, but the risk would be caving in to their tantrums and losing any progress you might make. I would quit catering to them, but make each meal with one thing they are known to like but alongside a couple of things you want to eat and want them to learn to eat. Say they will eat mashed potatoes, but not salad or chicken. Serve that meal. You can accelerate the process by starting with their least favorite of the foods they will eat. Maybe serve it repeatedly, maybe, and rather unappealing than appealing. Serve it a little cold, or in a cardboard container. Serve a couple of other dishes that are among the likelier foods they might consider eating. Server them beautifully, fragrantly, enticingly. You want to set up eating at your house to serve and suit the unfussy, not the fussy. Make being unfussy more fun and interesting and satisfying than being fussy, in every way. This is a more effective way to reward better eating. They won't get resistant if they don't know what you're up to. Just very subtly, gradually turn up the pressure to move in your direction. You can start slower by having two things at the table they will eat and only one they won't. Baby steps could be only having a little of one of their foods, gradually phasing out their foods. You don't want to punish yourself with the process, or them, unnecessarily. Keep them alive, but don't continue to encourage their fussiness by making it work for them. You can do this as gradually or as aggressively as you are ready for and as seems to be productive. The idea is to move them away from their narrow range of accepted foods and toward a wider range and toward new foods. Keep pressing forward, however slowly. They will get used to whatever you keep doing and they will adapt. Their hunger will drive them. DO not ask them to try anything at all. Pay no attention to what or how much they eat, other than insisting everybody can have some of each dish if they want. Don't let them hog all of the one thing they will eat, for example, if you parents want some. Tell them, "We all want some of that." Do you see how this approach is so different and values the food and encourages wanting to eat it more than saying, "You have to eat that"? Do not take notice if they do try something new. If you make an issue of it, they will not want to do it. They lose face by trying something new if this has been a battle. Quit fighting them and they won't have anything to resist. If left free to eat or not eat as they like, they are bound to eventually feel safe enough to eat other things. They are going to be hungry (make sure of that), things are going to look and smell good (also make sure of that). You can gradually increase the change as they seem to be ready for it and how much hunger and crying you are ready to deal with. You can doing things like casually have short supplies of their favorites but some very appealing other options. If they're hungry and you DO NOT urge them to eat, they are certainly going to be tempted. We want them to feel tempted, not pressured. Just keep setting up a situation to move them in the direction you want them to go. I can't say how long it might take; it all depends on them and on you. But the important thing is to keep moving in that direction, very casually, very unemotionally, and with NO pressure whatsoever to eat anything. Let them be hungry if that's what they choose to do. It's like gradually weaning them off the breast to a bottle. Don't make it about denying them what they want, but just use tactics like casually being out of things while they are really hungry and offering better options. Stay casual all the time about what and how much they choose to eat. Basically, while being really nice, gentle, sweet and subtle about it, you want to move them toward not being able to stay alive unless they start eating more normally. Their health depends on it, actually. I have many posts that going into more detail on these subjects and I encourage you to browse through the titles. Maybe start with the category "Masterly Inactivity." I am going to write a post about food tantrums coming up. Also I'd love for you to consider me your own personal feeding coach. Keep me posted and ask me all the questions you want. I will help you through the process. Don't hesitate to ask. I love doing it! I just found this site for the first time and I am loving this dialogue. I have a 3.5 and 1.5 year old. My older daughter has always been hesitant, even visibly scared to try new foods. It is not a matter of trying things and not liking them, it is a matter of not trying at all. My younger daughter has a healthy interest in food, although is beginning to pick up 'rut' from her sister. My husband and I are not 'bleeding heart' type of parents, but this food thing has haunted us for a long time. We make a separate dinner for our daughters, because we have always heard not to make food a battle. In our home, making them eat what we eat wouldn't be a battle, it would be WAR, and a long siege at that. I have considered making a sticker chart to encourage/reward her for trying 3? bites of a new food. Perhaps if we got through that, then she (and I!!) could feel more comfortable that only serving a family dinner would not (or at least should not) cause our very own d-day. I should note that, at this juncture, our mealtimes are tolerable (behavior-wise) and both our girls do eat a reasonably healthy, balanced meal at each meal (albeit it is the same darn food everyday). So it is not the worst situation in the world, but I do wish that when we had to have a meal at a restaurant or at a friends house that i would have to take along special food for them. I am wide open to detailed suggestions and encouragement about how to implement this. And, if i do need to do the tough love part of this, how exactly does a parent deal with a crying hungry child? And how long would you expect it to take before seeing some results? THANK YOU IN ADVANCE SOOOOOOOO VERY MUCH for any tips/encouragement. Anna, I haven't been ignoring your last comment, and I think you would make a great speaker/coach in the area of childhood eating habits and behaviors. Yes, your advice did help us...while we used it. We were doing really well, and mealtimes were becoming very enjoyable. Then we moved, and it seems we started back at square one. Just this afternoon, we were fighting with our kids because my husband and I were completely finished eating and they both still had platefuls of food left. Of course, we reverted back to our own bad habits and threatened, raised our voices, and gave "dirty looks". Honestly, our move and subsequent remodel has thrown everything in our home off...school, habits, schedules, everything. We are finally getting back into a "normal" routine, but it's taking a lot of work. I do thank you for your advice. This particular post was just what I needed to read after a stressful, Sunday afternoon lunch. Thanks again! Oh right, I have a Vegetarian Foodie Fridays carnival I invite you to link to. My site is mainly a breastfeeding and natural parenting site all the rest of the week except Fridays when I get to live out my passion for real food veggie style. I love Fridays. :) Anyway, i think you might get some extra readers for this since it's up my alley and my readers too. This is timely for me. Our problem is that we like to have ice cream (our junk food of choice) in the summertime after dinner and if our kids don't eat their supper they can't have ice cream. Well, it makes them eat their dinner sometimes and sometimes it doesn't, and of course when they don't get ice cream they have tantrums. I get what you are saying and want to play that way, but I want my ice cream too. Arg!